Hello everyone, John Pietersma here. 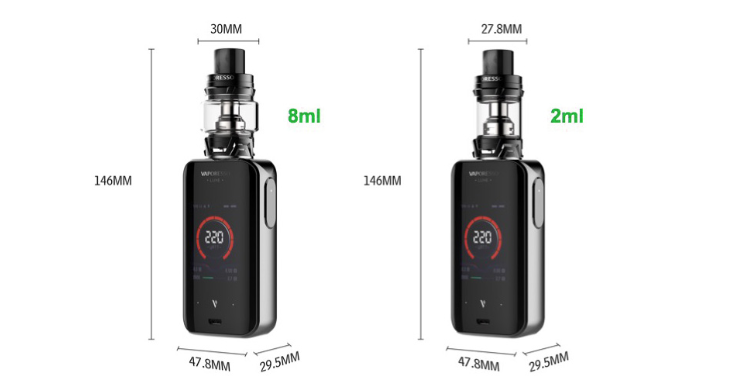 Today we’re going to talk about the Vaporesso Luxe 220W Touch Screen TC Kit. If there is one company that consistently releases great products, it is Vaporesso. Speaking from a personal perspective, they produce some of the best hardware in vaping. They are not as old in the industry as some companies are but their track record is nothing short of spectacular. The technology that sits behind each product is well thought out, dependable and performs very well. Usually, the time span between each new item is a bit longer than this round but Vaporesso is back yet again with the Luxe 220W kit. Stick around to learn all there is to know about this new piece of vaping hardware. When it comes to aesthetic design, Vaporesso is far ahead of the pack. Each device they release has some sort of new, very fashionable design about it, most of the time. The last device, the Polar, was a slight mimic of the Revenger but it still has it’s own feelings about it. In late 2017 they released the Switcher which was one of the most unique designed mods of the year. Now, the Luxe is somewhat similar to the Revenger body shape but it definitely has it’s own face. The Luxe has a very high sheen finish to it so expect it to look fantastic. The device also features a massive 2-inch color display, easily able to be read in daylight. The curves of the device and overall body shape seem to have been slightly borrowed from the Revenger. If that was the intention or inspiration, it looks fantastic. As with all Vaporesso devices, the panel opposite the screen is removable and houses the two 18650 batteries. The device flows really nicely, especially with the touch screen operation. There are no buttons aside from the fire button on the right-hand side of the screen. This allows for the overall appearance of the Luxe to seem very fluid and smooth, and it is. Since the release of the Revenger V1, the NRG tanks, and their coils have been the go-to tank for Vaporesso. Over the last year, they have released one other tank, The Cascade, which accepted NRG GT Cores of all types. Each tank had its advantages and they both performed very well. The flavor from some of the GT cores is fantastic, unlike any other Sub Ohm tank experienced. The SKRR is an entirely new innovation from Vaporesso and it claims to be revolutionary in flavor production. It will accept the same GT Cores that all previous tanks have used but they also have the own set of new coils. The SKRR has three new coil types available to be used along with the GT Cores and they are fairly interesting. Each coil uses a combination of Flax Fibre and Cotton as it’s wicking material. I have never seen Flax Fibre used in a coil before but it certainly sounds very interesting. The three new coils are the QF Meshed, QF Strips, and SK CCell. The SKRR also features a Quad airflow with four good size airflow holes. This should, in theory, increase the flavor experienced quite a bit. From the experience of using a tri-airflow tank that produced better flavor, the SKRR should deliver on its promise. 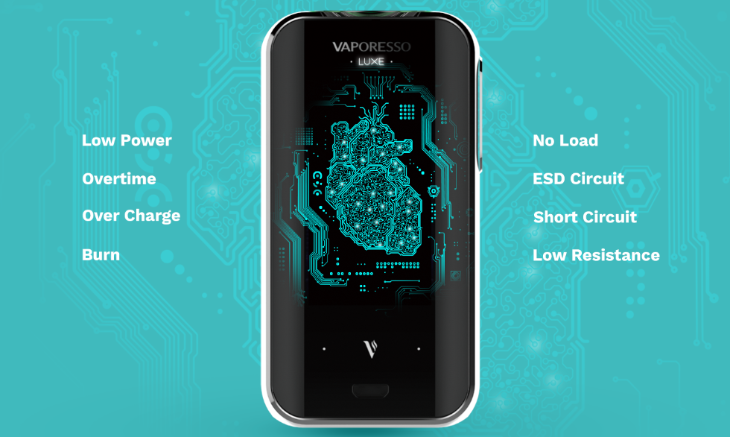 The technology behind each Vaporesso device is pretty astounding. As a long time DNA user, the boards inside of Vaporessos hardware is extremely comparable, if not just as good as any DNA. The Luxe is equipped with the new updated Omni Board 4.0. OMNI has been the board used on all Vaporesso devices and it is top quality. The firing speed of these devices is as instant as you can get, set it to your preferred temperature or power and it hits the mark right away. The OMNI can either be basic and you can just use it as is from the factory or it can be in depth and complicated. The OMNI will allow for many different programmable settings to be made in the device menus so that the perfect vape experience can be easily achieved. OMNI is overall a very reliable board that performs well, all the time and the durability seems to be quite long. If it is not obvious, I am a Vaporesso fan, big time. I love every product they make and I recommend them almost daily. I look forward to seeing their success with the Vaporesso Luxe 220W as I know that anyone who purchases it is going to absolutely love it.